Their story is a positive answer to the question: What are the chances? In a chance encounter, a neonatal nurse has come face to face with a preemie whose life she helped save 28 years ago. And now they are colleagues! 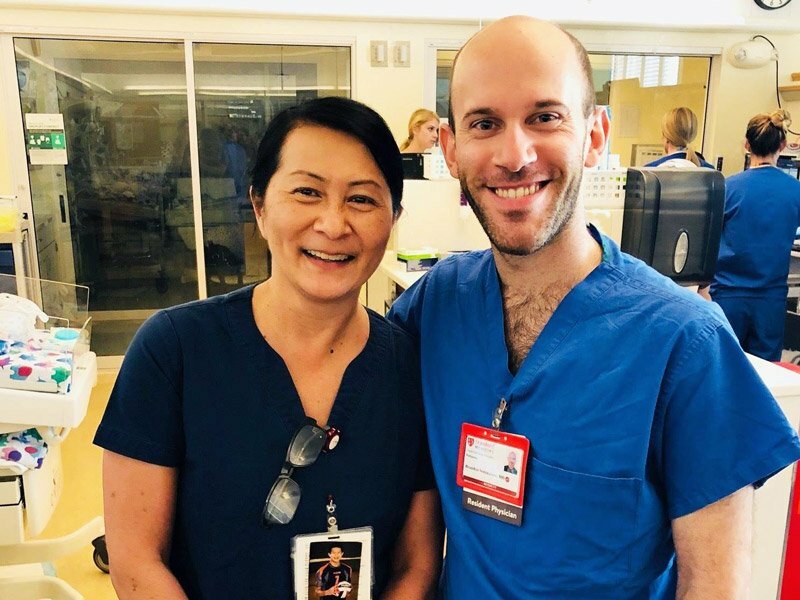 Dr. Brandon Seminatore was born at Lucile Packard Children’s Hospital Stanford where he was cared for by neonatal intensive care unit (NICU) nurse Vilma Wong. The hospital shared the story of their chance reunion on their blog and their Facebook page and it went viral on Facebook and other social media platforms. Seminatore was born 11 weeks premature at Packard Children’s 28 years ago and Vilma Wong was his primary care nurse in the NICU for more than a month during which time she developed a close relationship with her tiny charge’s parents. So much so that almost 30 years later, she realized who Seminatore was when she met him and heard his surname. They met when Wong noticed a young doctor taking care of one of her patients. She approached him and asked who he was. When he told her, his surname rang a bell with her. Not only was he one of the infants she had cared for years ago, he was now a doctor training to be a child neurologist. The family never forgot the professional care the tiny Seminatory received from Wong and fellow nurse Kas Pilon. His mother asked him to make contact with the two women when he arrived for his residency at Packard Children’s, but he assumed that they had retired and didn’t follow up on his mother’s request. “Meeting Vilma was a surreal experience,” Seminatory said. “When Vilma recognized my name, it truly sunk in that I was one of these babies. I’ve come full circle and I’m taking care of babies with the nurse that took care of me. According to a report by The Mercury News, Seminatore weighed only 0.6 kg when he was born and left the NICU a healthy 2.3- kg baby after more than 40 days in the unit. In the meantime, Seminatore’s father retired San Jose police officer David Seminatore, found a photo the family had kept all these years of Wong holding his tiny son. Wong has worked as a neonatal nurse in the NICU at Packard Children’s for 32 years, a very challenging and stressful job.